I currently live in Detroit 4 days a week, and commute home to my family for the other three. This necessitates living in a small apartment in Grosse Pointe Park, and of course, getting the obligatory pizza from time-to-time. Delivery is somewhat limited in Detroit, and I decided to order on-line a few weeks back from J*******’s Pizza. I tried for 30 minutes to get to the order page. Finally I just gave up and ate some Cheerios, but before I did, I fired off a note to the “webmaster” at the pizza store. Through their “contact” form. ﻿My name is M***** C****** and I currently work in the online ordering department. I was wondering if you could tell me exactly what happened so that I can better assist you with this problem. I have complied a step by step instruction guide to order online. I sincerely hope this helps! 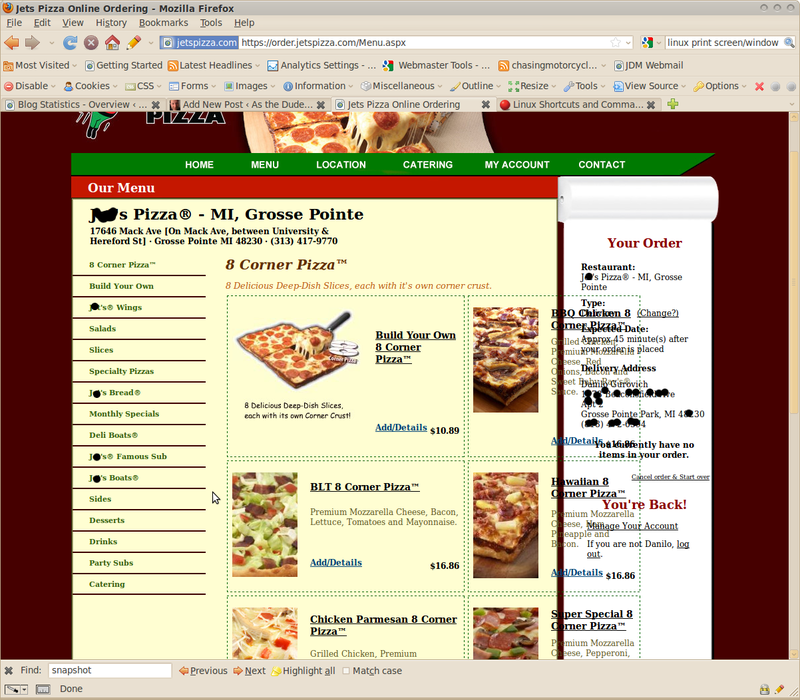 We at J****’s Pizza® want you to be just as excited as we are for online ordering. Choose your items. Use the left hand navigation bar to help you find your favorite products. When your order is complete: To finalize an order you must click the yellow “Edit/Complete Order” button, and review your order to ensure it is correct. Then on the next page click the yellow “Proceed to Checkout” button. Then on the next page complete your payment information and click the yellow “Submit Order” button. The final page will confirm your order has been submitted and have details of your order including restaurant, order type, and expected time/date. There is also a helpful guide at the top of the page listing steps 1, 2, 3. When you order has been submitted you will also receive an email with the subject “Online Order” proceeded by the location you have ordered from. The email will resemble a receipt detailing the store and order information. Input your zip code and click “Search” — takes you to a google maps embed with a bunch of stores, and your approximate location as a tiny map pin. The store I want is highlighted. Why don’t they just take me to the order page and highlight the name of the store somewhere in there? Put the food in front of me for God’s sake! Click “Add New Delivery Address”, input your information, and click “Add Address”–even if you click “returning user”, you still have to confirm the address or enter a new one. Another page, another click. Select your expected time (“ASAP” or select a specific date/time) see above — I can finally see food to order. The final page will confirm your order has been submitted and have details of your order including restaurant, order type, and expected time/date. — I get to confirm my address one more time! They want to make damned sure that I’m getting my pizza! If you’re going to have on-line ordering, knock off the number of screens, knock off the number of clicks Small operations often make usability mistakes, often because they have “weekend” developers, or worse, the management has someone that “has some Internet experience” build the pages or implement some pre-built store. I can’t tell what happened here. It’s just a train wreck. Plaster Order now everywhere, with a zip code entry in the “portlet”. At that point you should know where it’s going. The landing page should have the name of the restaurant plus a possible alternate. It should also have one set of radios for catering, etc. GO TO THE FOOD NOW. Confirm the order, and have a returning user login or address form with an optional sign up on one page. Done. Steps eliminated. Here’s a thought. Go through the Amazon order process, new customer , existing customer, etc. They’ve spent millions upon millions of dollars streamlining that process. Just dupe it. You’ll be 90% of the way there. At this point, you’re about 10% of the way there. This entry was posted in eCommerce, Enterprise Development and tagged ecommerce, mulit-variate testing, testing, usability. Bookmark the permalink. ← Moto Guzzi V7 Classic – 10,000, ahhh, I mean, 11,000 mile report!